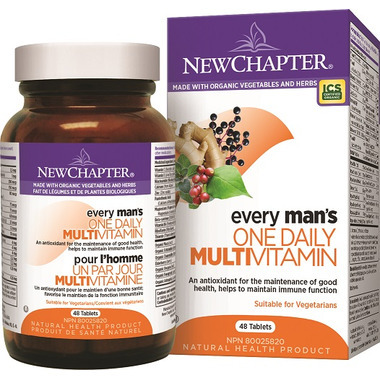 New Chapter Every Man Vitamin & Mineral Supplement is non-GMO and organic. This supplement is an antioxidant for the maintenance of good health, helps to maintain immune function. I bought these for my husband! He loves them. Theyâ€™re quite a big pill since its only one a day but manageable. The label says to only use for 3 months consecutively! Best brand for vitamins. Best vitamin out there. That being said, the pill really is big and hard to swallow. These multi-vitamins are the best bar-none. No frequent urinating like other cheaper multivitamins. They brighten up my entire day. the only organic multivitamin made from herbs and vegetables in the market, highly recommend it for those who are careful about what goes into their bodies. Quality product that can be taken on an empty stomach without any repercussions. On the other hand, it's quite a big pill and some may find the smell unpleasant. I'd say overall this multi vitamin is pretty good, but the tablets are somewhat big and hard to swallow. My husband's been taking this for a year now & can feel the difference if he forgets to take them daily. Its organic & nonGMO! Thanks Well.ca for having them on your bundle sale for buy 1 get 1 free! !